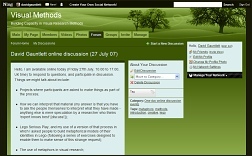 On 27 July 2007 the website of the UK's Visual Methods training network (funded by the ESRC) hosted an online discussion between David Gauntlett and some other members of the network. The network runs events (which you can read about on these pages), and then the website offers additional material and online support to people who have attended the events. Because that means it's a semi-private network, the discussion is also reproduced below for anyone who may be interested. And anything else you like. My new book Creative Explorations (2007) discusses all of this stuff and you may want to ask me questions about that too, possibly (!). I am looking forward to seeing you here. Hi David. I have just finished reading Creative Explorations and i found it really fascinating. The idea of doing research where the visual artefact that people make is *entirely* in metaphor(s) - not just something that *may include* metaphor but which is necessarily *always* all metaphor - is really interesting and i wondered if you had considered ways of doing this beyond the Lego method? Hello Kate. Thank you, glad you liked it! Yes, I liked the fact that this approach was able to get away from the literal nature of photography or video projects - where you have to point the camera at something in order to make pictures. I think that that can make the visual material produced less imaginative or expressive - or at least, more to do with the physical world you live in (that you can see) as opposed to the complex subjective world you live in (in your mind). So, my process (based on the Lego Serious Play process) where *everything* is done in metaphor, as you say, takes you away from that literal world. I found Lego to be especially good for this as it's just a set of parts - bricks, animals, trees, windows, wheels, etc - that you basically *have* to attach your own meanings to, to make it meaningful. I'm planning to offer participants an *array* of possible materials for my next study. I tend to think that the Lego is especially nice though! Nobody has managed to raise a decent objection to it yet. I have found that older academic women, hearing about the project, sometimes say it's a boy's toy, but none of my participants have said that (men and women from a range of backgrounds and ages). Other materials, such as clay, would be more 'free', theoretically - you can make what you want - but are frustrating for many people who feel they lack the ability to make what they have imagined. I think it would take (even) longer as well. I am convinced of the value of this kind of research although I have the same worries as Leila about convincing sceptics (who may never be convinced but are surely worth the arguement) about analytical rigour. Most of my work is in transcultural research and makes use of participatory video and photography in which people make films or construct photo galleries about their lives. Using visual methods helps the participants and myself to communicate across language and cultural boundaries so it works for me and them too. Because of the language issues it isn't really possible to engage in in depth interviewing etc but during these projects we make notes on events, discussions and so on, that occur during the day and I compare my observations with other members of the project team. Completed films and galleries are exhibited to the wider community which normally results in enthusiastic debate and discussion about the issues raised or omitted. Again recording of these discussions is after the event and collaboratively reviewed. During the project I work with a rudimentary translation of speech plus the visual narrative. This gives me, what I feel , is a reasonable insight into the stories. Later on the subtitles are added and the films are published on DVD and the Web enabling a wider dissemination and encouraging further analysis from audiences. All of this is because I want to engage participants in the analysis as well as in the production of the original materials. The whole process is meant to be transformative for all of us, researchers and community participants. Have you any suggestions as to how I might improve on this attempt to triangulate evidence and analysis and avoid the criticism that these is just "common sense reasoning"? You can watch some of the project films from Brazil, Kyrgyzstan and Salford at www.visiblevoice.info. Your process sounds highly collaborative, especially since the work goes through a whole cycle of production, then exhibition, and then that's not the end of the process as you say this again leads to a discussion about meaning and interpretation, what's in and what's been left out. This sounds like a thorough process thinking-through what it all means, using the community's *own* expertise and insights based on their years of living and reflecting and talking. So, unsurprisingly, I think this process stands up incredibly well to the weak criticism that you are somehow just relating people's common-sense statements but failing to add the expert analysis that it is the sociologist's 'job' to provide. This (as you know) was an argument made during a discussion at the Leeds event in May - that a sociologist's job is not to simply report what people say (or visually express) about their lives, but to add additional sociological insights and understanding which people 'on the ground' may not be in a position to provide. My reply to that is that yes, the sociologist should use their priviledged/educated/well resourced position to provide broader understandings of social lives and realities - the kind of thing that individuals may not directly be able to tell you themselves. But this can be done by giving people the opportunity to reflect and express things that they might not normally spend time considering - because of the everyday busyness of life - just as you do in your projects; and then broader understandings and insights can arise from that (and can br drawn out through the kind of iterative reflective practices that you are talking about). Just a quick question about the middle bullet point you raised - allowing people to interpret their own creative outputs rather than going down the 'researcher as expert' road. I share your position on this. At the Leeds session you didn't go into your views in any detail but seemed very confident of your position. I wonder if you can say how you would back up your view if asked to go beyond common sense reasonings. I really struggle with this when I am trying to discuss the point with sceptics! Also have you written about this somewhere that I could look at? Thanks. I am going to be offline (probably playing lego for real - it's the school holidays!) for the rest of the day so won't be able to get into a dialogue but just wanted to ask that quick question. Hi Leila. Good question. I *am* confident of this position, but it's not exactly something you can conclusively 'prove' to be correct, I think, as it's a matter of beliefs or ethics. Personally I don't think there can be a fully justifiable reason for why a researcher would impose their own reading of a visual thing that someone had made, over the top of the person's own account. At least, you have to take the person's own account as a starting point. I find it rather offensive when 'experts' want to supply a reading which the person who made the visual item would not have suggested, and may not agree with, because it's just not justifiable to assume that you have that superior knowledge - to assume you understand someone's inner world better than they do themselves. Especially as you have probably only met them for an hour or two. Over time, a therapist and their client can collaboratively put together accounts and insights about that person - the client - which may not have been immediately apparent to them. But (a) they do that together, and (b) they do it through a dialogue which can take years. I feel I should start by claiming my inexperience of online real time conversation. While I would like to claim (digital) native status I feel very much an immigrant. In verbal conversation of course I would follow up that statement with my definition of those terms and the issues and concerns I have with oppositional positions like native/immigrant…. In my research I am interested in how young people at a non-profit media centre engage with digital video production processes, the creative and educational potential of these forms and how technology, and technology production, is adopted to frame a narrative of transformation. I am also interested in the use of digital technology in ethnographic research and the implications of digital production (and presentation) in educational research. I wonder what the difference is when participants are *asked* to make things as opposed to the process of making (and reflecting) being part of an experience or an event. Do you think that there is a difference in how participants might view the process and how does this affect the research? I also wonder how participants learn to reflect and make meaning out of their productions. At EVC young people are 'taught' (over a period of time) how to reflect on their contributions and how to give feedback to the productions of others. This means of course that they use a particular shared language which is learnt through the production process and makes meaning and interpretation clear (I think). How are your participants asked to interpret what they have made and does the metaphor not push the process and the reflection away from the experience? A related question is can the making be the whole process? I believe making (although I'd call it production) includes reflection (or post-production) where what is made and the makers role and abilities is reflected on. An easy question to end with - was the lego work with adults only? Why? Most adults don't play with lego where as children do so again more time and space is created through the research process. MLW: "I wonder what the difference is when participants are asked to make things as opposed to the process of making (and reflecting) being part of an experience or an event. Do you think that there is a difference in how participants might view the process and how does this affect the research?" DG: Yes, it would be a bit different i guess ... although doing a Lego session with me (or a similar project by anyone else, where people make things and talk about them) is itself "an experience or an event", so, in both cases the people are taking part in an event of some sort. A bigger opposition would be, say, a person doing a painting as a form of self-expression simply because they want to, compared with someone doing the same thing because they were taking part in some research event. Obviously the motivations would be different there. But both would be equally interesting, I'd say; but you'd need to bear the circumstances of production in mind when thinking about what was produced. MLW: "I also wonder how participants learn to reflect and make meaning out of their productions. At EVC young people are 'taught' (over a period of time) how to reflect on their contributions and how to give feedback to the productions of others. This means of course that they use a particular shared language which is learnt through the production process and makes meaning and interpretation clear (I think). How are your participants asked to interpret what they have made and does the metaphor not push the process and the reflection away from the experience?" DG: They would just talk about what they'd built and what it meant. They have not been 'trained' to do so, but having had the highly-invested experience of making their model, they are well able to talk about what they made and why. They were able to reflect on the parts of the whole, and the whole model, in interesting and revealing ways. And to answer the last bit ("does the metaphor not push the process and the reflection away from the experience? "), I think that because you have created the metaphors yourself, as a participant, then that is especially involving, not distancing, so - no. (Unless i've misunderstood what you mean). MLW: "A related question is can the making be the whole process? I believe making (although I'd call it production) includes reflection (or post-production) where what is made and the makers role and abilities is reflected on." DG: I agree. In my research you don't just get people to make things - they have to reflect on and interpret them as well - otherwise we would not know what meanings were associated with the thing-that-was-made (as we saw in the discussion about interpretation above). MLW: "An easy question to end with - was the lego work with adults only? Why? Most adults don't play with lego where as children do so again more time and space is created through the research process." DG: I've done research with young people before but yes this was with adults. I guess maybe i like to give people unfamilar materials -- when I asked children aged 7 to 11, in 1995, to make videos, they had not used a video camera before and found it exciting and novel. (And they were able to do it). Asking adults to use Lego is like an inversion of this I suppose - a 'childish' medium for adult participants! I also, of course, thought it was suitable for the task in hand. The research question, about adults' sense of self-identity, came before the method, as I think it should, so the use of Lego wouldn't then prompt you to suddenly decide to change that and do it with children. But you *could* do it with children if it was a useful tool for the particular research question. Hi David, this is more a teaching than a research question (though, thinking about the foregoing discussion, I am less and less sure of the difference!). I want to try the idea of building an identity out of lego with a first year education class next semester. I have a 4 hr session and a small group, so I think there is plenty of time to explore the idea. Have you any advice or suggestions to offer? How much Lego do I need (and what kind)? How is it best to introduce the idea? Hello Rob. Hmm this is a tricky one . . . The official answer from Lego Serious Play is that only certified practitioners who have been on the intensive week-long training programme can facilitate it, because it's a subtle and complex process, built on a lot of psychological research. Having 'amateurs' claiming to do the same thing would dilute the quality of the process and the reputation and integrity of the Lego Serious Play process, they would say. On the other hand, they are happy to accept that they cannot stop people doing interesting creative things with Lego - they are perfectly happy about that, obviously. I would say that it *is* quite a fine art and that you do need to take participants through certain steps before you can expect them to build complex metaphorical representations of things such as their identities, or their organisations, or themselves as a group of learners. First you need to get them used to using Lego. Then you need to do some simple exercises in building metaphors. Then things can get more complicated. You need to give everyone time to build (you can keep the pace up, but as a participant it's frustrating not to be allowed time to do what you want to do) and also to go round the table and explain what they've made at each stage. The Lego Serious Play modules give participants a good range of Lego and Duplo (Duplo being the double-size stuff for younger children that interconnects with the standard Lego system). Just having the standard Lego *bricks* is not very helpful, as people are then faced with a difficult construction task to make what they want. The nice thing about the Lego Serious Play modules is that they contain a lot of Duplo animals and various other nice chunky things (doors, windows, trees, flowers, sparkly things, etc) which mean that even people who are not keen on constructing too much can still get a number of elements and apply metaphorical meaning to them. Forgive the plug, but you asked for details, and my book Creative Explorations contains many more details about the process and about the philosophy behind it. In addition you asked about adding images to an archive. This would, of course, be possible, but the problem is that each model is usually packed with metaphorical meanings ... which necessarily have to be explained to anyone viewing it. Therefore, photographs of the models are, in themselves, almost entirely meaningless. (You can make some basic assessments - "This one looks chaotic!" or "This one looks austere!" - but the real meanings of each model cannot be shown in a photo). Some form of labelling might help ... but basically the Lego building process is a way of enabling people to share stories about their lives or experiences ... and photos of the models just don't catch any of that richness - in fact they don't show it at all, really. Thanks for the reply - I hadnt realised there were serious courses! I have ordered the book! I can see what you mean about the limits of a photo archive - I guess it has to be text plus images. What might be a good way to start would be to see if anyone else out there would be interested in an exchange of responses with another group. To clarify about the "serious courses"... The formal Lego Serious Play website can be found at www.seriousplay.com. This is a division of Lego, and I collaborated with them for my research. To date it's a consultancy process for businesses and organisations, but they're interested in developing it in other directions, which is why they contacted me. They're working on versions for families and for education. OK, thanks everybody for participating today. Hope you found some bits of it helpful. I'm off to have a cup of tea and a banana. Thanks David, today's discussion was very interesting. Website with information about a range of creative visual studies, where people have been asked to make something as part of a social science research process. ArtLab information about the study in which I asked people to build metaphorical models of their identities ... in Lego. New book (published by Routledge, 2007) in which I discuss these kind of projects, and their philosophical and methodological background. Includes full discussion of the Lego project, with findings!